When Sharon Toong of House of Sylphina and her husband found a flat in a converted factory in Dalston, a trendy area of East London, they could see the space's potential. At the time, the apartment had dark rooms that were out of proportion. The couple, both architects, knew they could make the home more functional and bring in the spirit of the neighborhood. To brighten up the place, Toong added bifold doors that open to the patio, a large window to the rear bedroom, and a full-height glazed wall above the stairs, which brings light into the center of the home. The ground floor's conversion to an open-plan living area added to the home's new feeling of spaciousness. The end result is a design that brings practicality to a cool, urban setting. Toong decorated the open living area with streamlined pieces. The sofa is by Hay, the floor lamp is from Ikea, and the corner cabinet is vintage. Eames chairs surround a tulip-style table in the dining area, which is illuminated by a Jean Prouvé Potence light. Toong found the console table on eBay and accented it with a round Ikea mirror. The kitchen cabinets mix painted and natural timber. The lower cabinets and island are topped with flamed granite counters and white ceramic tiles were installed as the backsplash. Toong focused on mixing natural materials with metallic accents throughout the home. Copper Frandsen ball pendants hang in the staircase, which is flooded with light from the new glazed wall. Toong chose to use gray as the primary neutral, noting that it feels more contemporary than painting everything white. The bedroom is outfitted with a Muji bed and a chandelier by Heal's. Subway tiles in a herringbone pattern line the bathroom walls, while porcelain patterned tiles were used on the floor and in the shower. The pendant light is from Graham and Green. The office's sofa bed lets the space double as a guest room. The vintage desk is paired with a Aeron chair by Herman Miller and the chandelier is by Made. 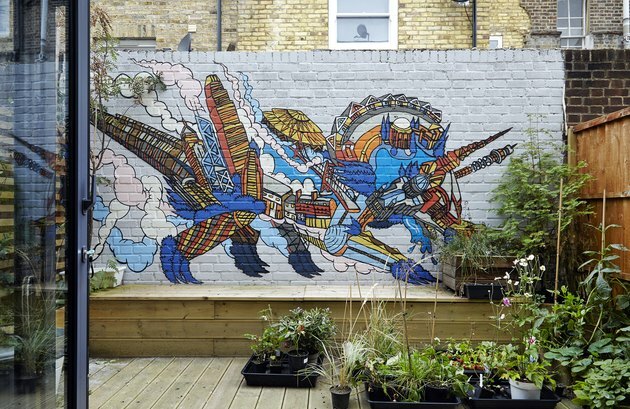 A mural that Toong spotted in Shoreditch — London's equivalent to Williamsburg, Brooklyn — inspired the choice to add an instillation to the back wall of the patio. The couple hired Bristol-based artist Andy Council to create the one-of-a-kind piece.